Having received wisdom and instruction for my life on Earth in this supernal way was a sacred gift I benefit from every day and offer heartfelt gratitude for with every breath. I have used the teachings of the Crystal Library to bring healing to thousands of people here on Earth and even in dimensions where the light of love is obscured by dark deeds. The wisdom learned in the Crystal Library flows throughout Song of the Heart – Walking the Path of Light. The Crystal Library – how blessed I’ve been. And as the mystery of destiny unfolds it is the week of my 75th birthday that the release of this youtube series of 22 5 minute videos, shot in one day, extemporaneously, is complete. I invite you to join me on a spiritual adventure to my home Planet. Close your eyes and allow yourself to experience with me, The Temple of Light. 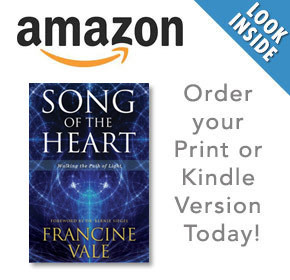 There is more about this remarkable sacred experience in the final chapter of Song of the Heart – Walking the Path of Light.